When Secret Wars first started, the novelty of the tie-in mini-series was rooted pretty much exclusively in their creative, engaging reimagining of some of Marvel’s most interesting characters and periods. These were more fun and isolated than integral to the ongoing Secret Wars series. 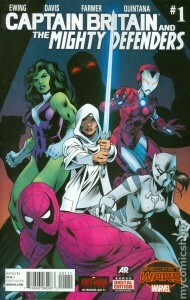 As the epic main event wore on, however, and the realities of Battleworld and All-Father Doom became more and more apparent, the mini-series have shifted accordingly and have incorporated this newfound doubt and paranoia into their reimagined worlds, creating a fairly straightforward narrative framework on which to hang the alternate characters and settings. Captain Britain and the Mighty Defenders #1 debuts about midway through the Secret Wars schedule, and the premise of doubting Doom and remembering the past is quickly established. Writer Al Ewing introduces us to an alternate universe version of Ho Yinsen and Tony Stark’s first meeting, except in this universe Stark gives his life to save Yinsen. This short prologue ends with Yinsen (as his world’s version of Rescue) confronting an Incursion Event. Ewing then brings us to Yinsen City, where Yinsen presides as Baron and She-Hulk acts as the section’s protector. The Defenders also protect Yinsen City—a team consisting of Spider Hero (an alternate version of the Prowler), Kid Rescue (Yinsen’s daughter), and the White Tiger (Ava Ayala). After some initial discussion of strange memories and doubts regarding Doom, White Tiger sees a woman walking toward the wall that divides Yinsen City from the outside. The woman, Dr. Faiza Hussain, smashes through the wall with the help of Excalibur and, after expressing her doubts regarding Doom’s omnipotence as well, teams with the Defenders as Captain Britain. Of course, whether Doom is a god or not is a moot point, as he hears this discussion through the technology in the area and opens the border between Yinsen City and their belligerent neighbors in Mondo City, which culminates in a shocking, immensely satisfying final sequence (think DREDD). Al Ewing and Alan Davis are the perfect pair for Captain Britain and the Mighty Defenders. In many ways, this series is the natural extension of Ewing’s work on Captain America and the Mighty Avengers, bringing together an exciting, diverse mix of primary characters and focusing on issues of community and social responsibility. Ewing’s work on DREDD also has a significant impact on his development of Mondo City. Davis is a comics legend, and his naturalism and classic comics aesthetic adds to the dynamism of the series. And both creators are British, so obvi. Also, it’s awesome to see some of the fan favorite characters and concepts from previous series like Captain Britain and MI:13 return! BUY! Captain Britain and the Mighty Defenders #1 is an excellent first issue to a promising, engaging series from Al Ewing and Alan Davis. The diversity of the cast, the central premise, and the thrilling final sequence make this debut extremely effective, and they all work together to make the next issue a must-read! Check it!